Multiple myeloma (MM) is an incurable plasma cell neoplasm accounting for about 10% of all hematologic malignancies. Recently, emerging evidence is disclosing the complexity of bone marrow interactions between MM cells and infiltrating immune cells, which have been reported to promote proliferation, survival and drug resistance of tumor cells. MicroRNAs (miRNAs) are small non-coding RNA molecules with regulatory functions in the cell, whose expression has predictive and prognostic value in different malignancies. MiRNAs are gaining increasing interest due to their capability to polarize the immune-response through different mechanisms, which include the molecular reprogramming of immune cells. This characteristic, together with the antitumor activity of miRNA mimics or inhibitors, make the miRNA network an attractive area of investigation for novel anti-MM therapeutic approaches. In this review, we will discuss the recent advances in the understanding of the interplay between MM cells and bone marrow resident immune cells, with special focus on the molecular and functional changes induced by miRNA network modulation. We will finally indicate potential targets for therapeutic intervention. Keywords: MicroRNA, miRNA, multiple myeloma, immunotherapy, tumor immunology, immune-response. 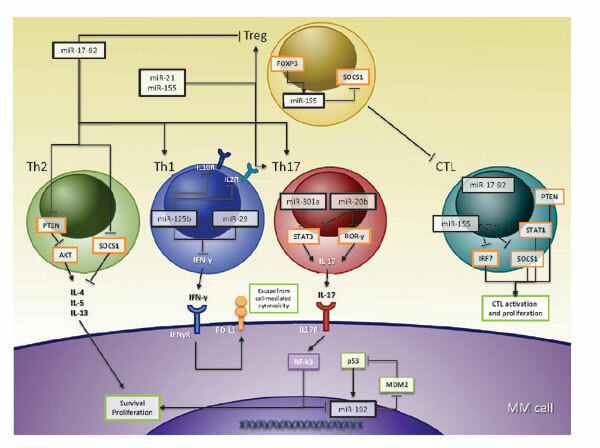 Keywords:MicroRNA, miRNA, multiple myeloma, immunotherapy, tumor immunology, immune-response. Abstract:Multiple myeloma (MM) is an incurable plasma cell neoplasm accounting for about 10% of all hematologic malignancies. Recently, emerging evidence is disclosing the complexity of bone marrow interactions between MM cells and infiltrating immune cells, which have been reported to promote proliferation, survival and drug resistance of tumor cells. MicroRNAs (miRNAs) are small non-coding RNA molecules with regulatory functions in the cell, whose expression has predictive and prognostic value in different malignancies. MiRNAs are gaining increasing interest due to their capability to polarize the immune-response through different mechanisms, which include the molecular reprogramming of immune cells. This characteristic, together with the antitumor activity of miRNA mimics or inhibitors, make the miRNA network an attractive area of investigation for novel anti-MM therapeutic approaches. In this review, we will discuss the recent advances in the understanding of the interplay between MM cells and bone marrow resident immune cells, with special focus on the molecular and functional changes induced by miRNA network modulation. We will finally indicate potential targets for therapeutic intervention.